Jason Evans, Associate Principal, presented “Repurposing Mid-Century Buildings for a New Generation” at the New York State Green Building Conference in Syracuse, New York on Wednesday, April 17. Jason co-presented with Jaimee Wilson, Senior Energy Engineer, of Pathfinder Engineers & Architects. College campuses across New York State experienced a building boom in the 1950’s and 60’s, built to serve a swelling student population in relatively quick fashion. As campuses rush to keep up with rapidly-evolving social and learning environments, the buildings constructed for a previous generation’s needs and expectations are starting to show their age. These older buildings’ worth is not yet lost, though, as they are prime candidates to be reinvented for a future generation of students and faculty. This presentation dug deeply into both the value and the shortcomings of a typical mid-century academic building on Binghamton University’s campus, akin to many that can be found on other campuses across the state. 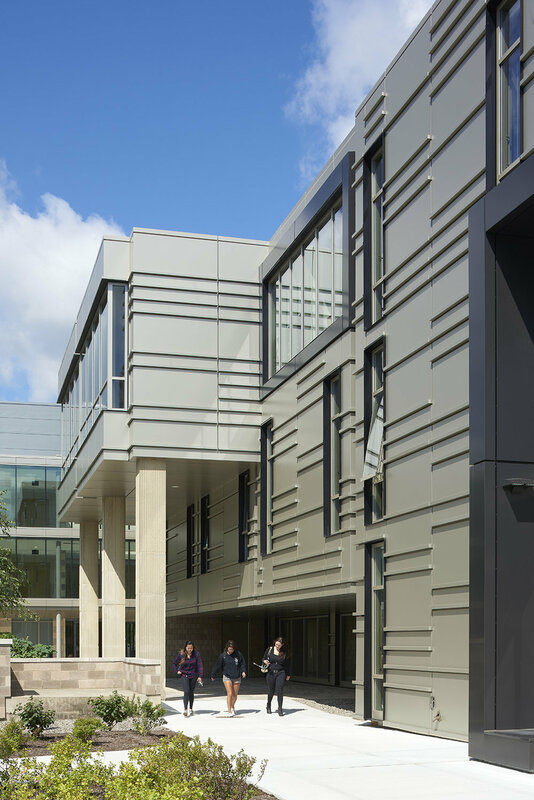 Using this building as a case study, the team walked through an analysis of its existing conditions, thermal performance, and academic usage, paralleling each with the trends and expectations of today’s educational environments. Via detailed visioning and programming exercises involving the architect and stakeholders from the campus, a clear direction and aspirations for the building and its future were formulated. The team explained this process, and how the aspirations were carried through to create a vibrant, dynamic series of spaces housed within a modernized, re-clad building – a formerly underutilized, underperforming building now a shining example of excellence for a future generation of learning. As the premier green building conference in the Northeast, the New York State Green Building Conference’s progressive advisory council has fostered growth by consistently bringing together top green building researchers, educators, and practitioners. Conference participants represent many industries including architecture, engineering, construction, consulting, deconstruction, landscape architecture, government, higher education, K-12 education, state agencies, real estate, and management firms.